I had read about Tyvek and watched some videos demonstrating its use, by Kim Tittichai. 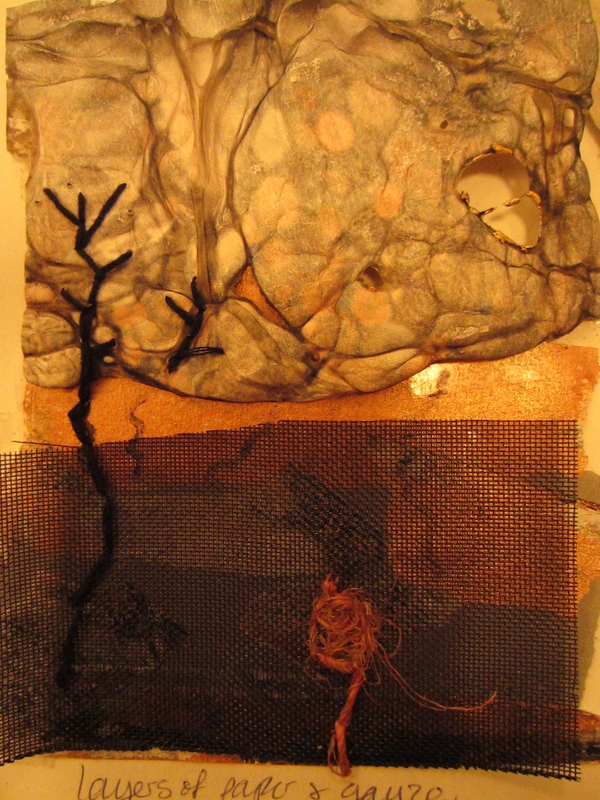 I also read ‘Layered Textiles’ by Kim Tittichai and was inspired to have a go. Unfortunately, I couldn’t find Tyvek in Tokyo and having read that padded envelopes are sometimes made of Tyvek, I tried to heat some of these, but to no avail – they weren’t Tyvek after all. I had to wait for a kind person to bring me some Tyvek from UK in the end. I first of all simply tried heating it with an iron to investigate what happens. Liking the result, I then sprayed the piece with gold paint. It was when I turned the piece over that I decided I liked the textures created on the reverse. This reminded me of the cave photo which I developed in Stage 2. I made a small collage in my sketchbook with the Tyvek piece and additional printed papers and gauze and then stitched into the layers, adding some line. I would like to take the time for more exploration with Tyvek, perhaps stitching before heating, to see what happens.